Remember the lady in the skimpy red and blue outfit with gold bracelets that could deflect bullets? Well we have another one in our midst. 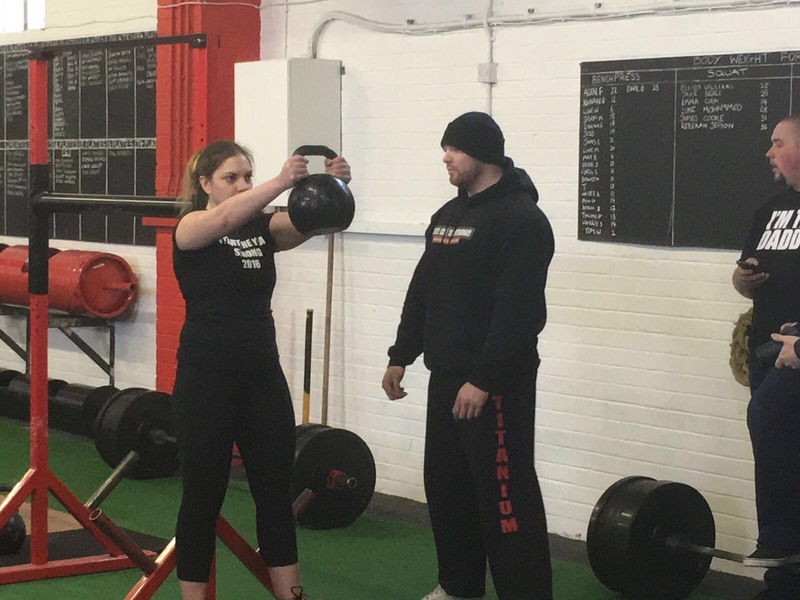 Hannah Hallsworth who runs Phoenix Fitness and is a key member of Team Evo burst into the Strongman scene two weeks ago with an amazing performance at the Titanium Strength Gym, Sheffield. 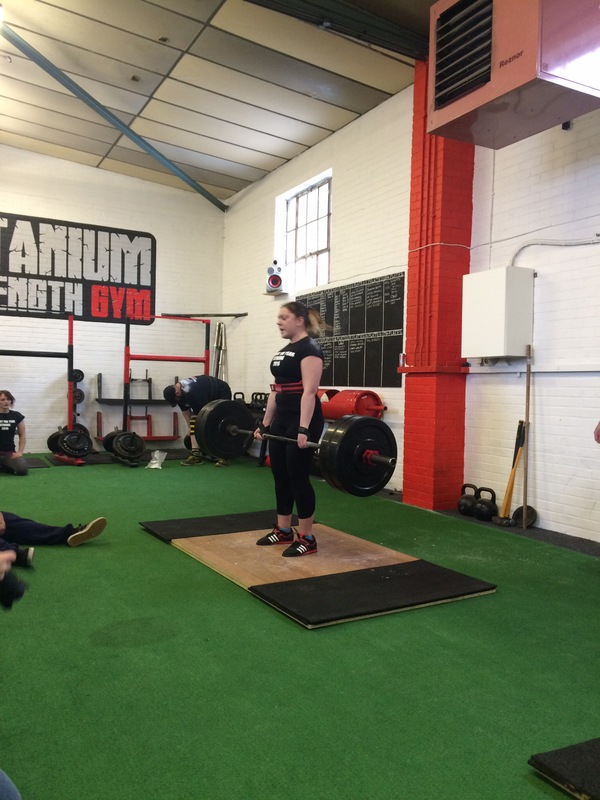 It was a snowy Sunday in Sheffield and Team Evo turned up in force to support PT Hannah in her first comp. the venue was great, the competition well organised and the atmosphere friendly and fun. A big well done to all involved it was a great advert for strength gyms and competitions. 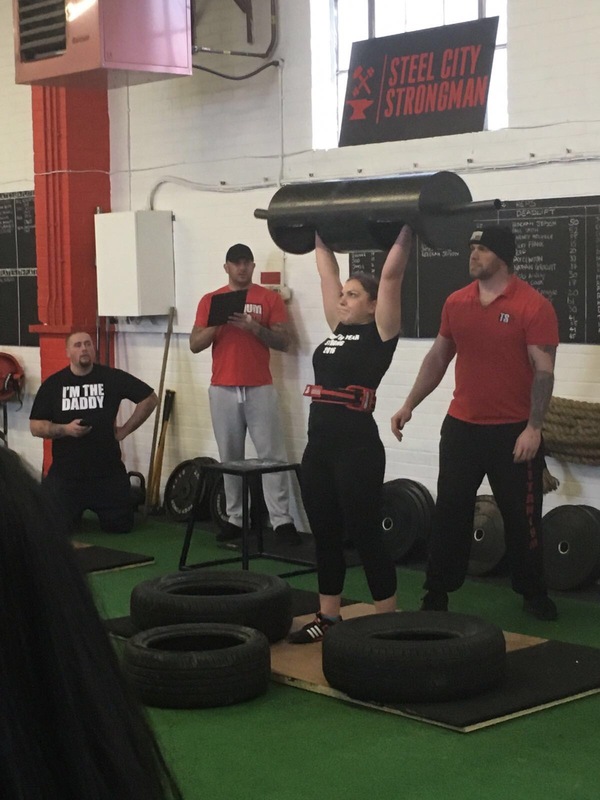 But back to the story…..
Hannah, never one to back down from a challenge, had been training for a few months to complete a log press 40kg ( for reps), yolk 165kg ( for distance), deadlift 100kg (for reps), static lift 8kg (for time) and atlas stones 40,50,60,70,80 (fastest time). A hefty challenge for anyone. Hannah stormed through the events some of which she had not competed before at the same weight so each one was a personal best. 7 on log press – a different version than in the gym so adaptation needed from the start. 18m on a 165kg yolk she had not actually lifted before; 14? I think deadlift; static lift over 2 mins more than anyone else. 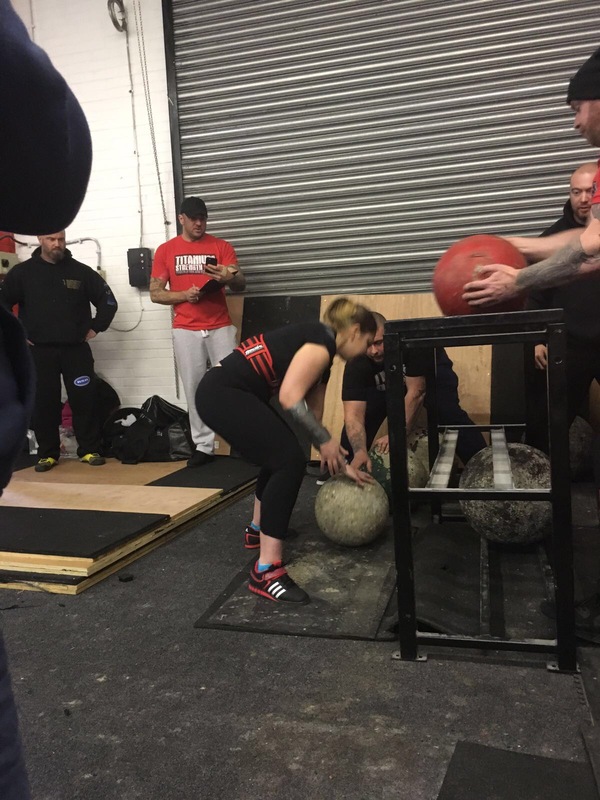 In second place going in to the stones Hannah excelled even her own expectations and slammed those stones only two of them managed it and the other competitor is the second strongest woman in Britain. On the podium in second place was amazing. A brilliant performance and great support we are will so proud of Hannah and her commitment and dedication to whatever she chooses to do. 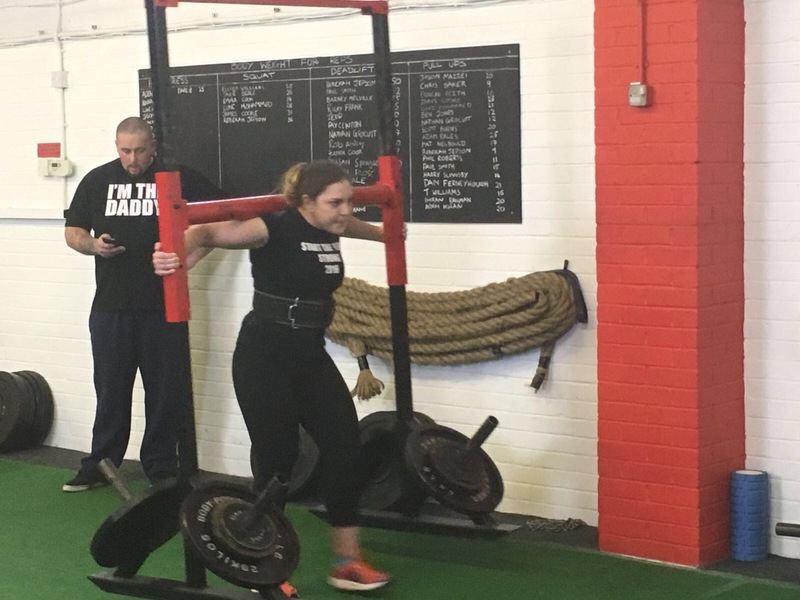 This entry was posted in Member Profiles, Strongman and tagged hannah Hawksworth, S20gym, sheffield, Team Evo on January 27, 2016 by billybicep. Well here we go in our way to Whernside in the North Yorks Moors for our first peak. I have done the peaks with mum and dad when much younger but now it’s my turn to be the responsible adult and find my own way (well with mountain goat Jon for company.). 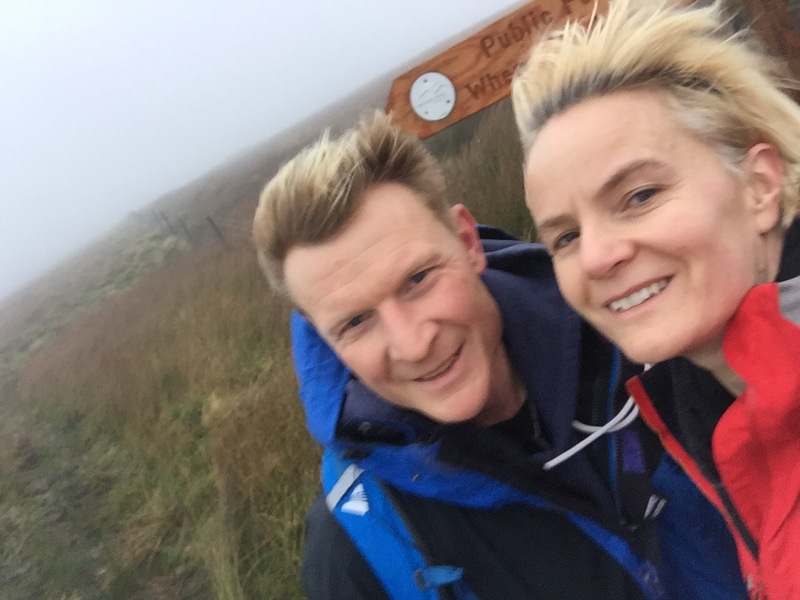 It’s about three months until our gym hike to take on the Three Peak Challenge in aid of Alzheimer’s. Not to be underestimated we will be walking 24 miles over some of the most beautiful English countryside. The beauty belies the testing nature of the terrain and that is why we are on our way today to practise on the highest of the three. As we leave Sheffield the weather is quite bright for a January day, not sunny by any stretch of the imagination, breaks in the cloud give hints of blue that raise the morale. We arrived in Ingleton and carried out our last bit of prep, fuel tank full on car for homeward journey and empty bladders (not a romantic image I know but essential for a long walk). Parking near the Station Inn at Ribbleshead viaduct we set off on our first peak. Oh my goodness 2.4 hours sitting in a car and I could not move; a back in spasm is not conducive for a long walk. I really thought I’d croacked it at the start but as we walked further I loosened up and all became more bearable. We had layered for the cold but in htis freaky winter of 2016 it was not cold and we realised soon that we had a layer too many. About 1.5 miles in we shed a layer and opened the air vents on our coats. 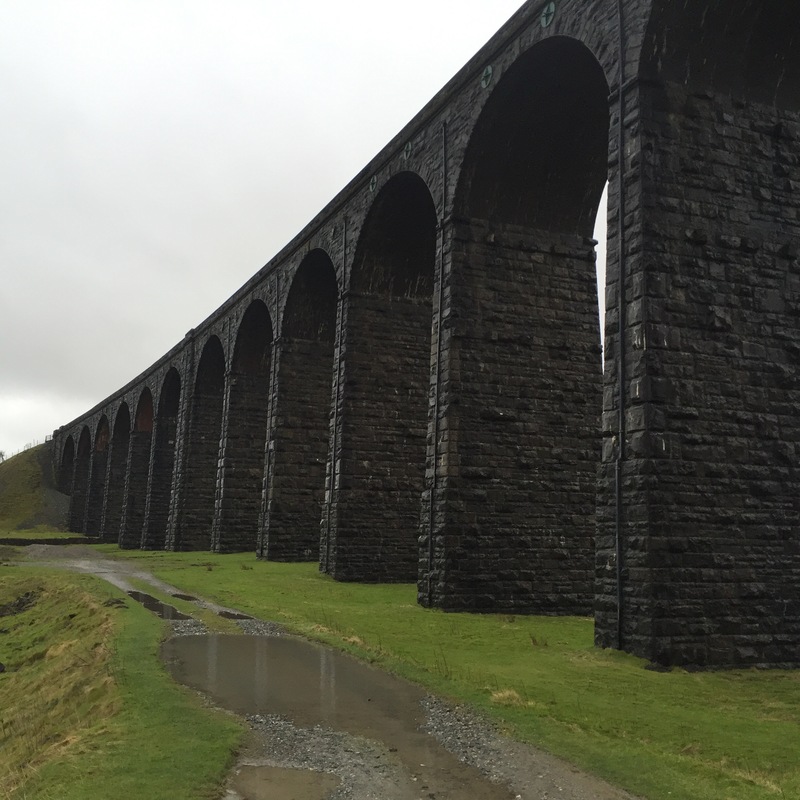 The surroundings were amazing course grass and lots of babbling water, images of the railway line and the Ribbleshead viaduct providing a link back to civilisation. Constructed between 1870 and 1875 it is a major feat of engineering and raises questions as to why and how ? The mounds you pass that are vents for the railway tunnel also lead you to question how they did it before all our modern technology. The power of man built it and amazing it is too. We passed a few walkers over the first section up to Force Gill but as we got to the Foss we had started to climb and we soon left them behind. We could not see the top, above Force Gill was in the cloud from the bottom and when you got to that level and looked back you could not see where you had come from. 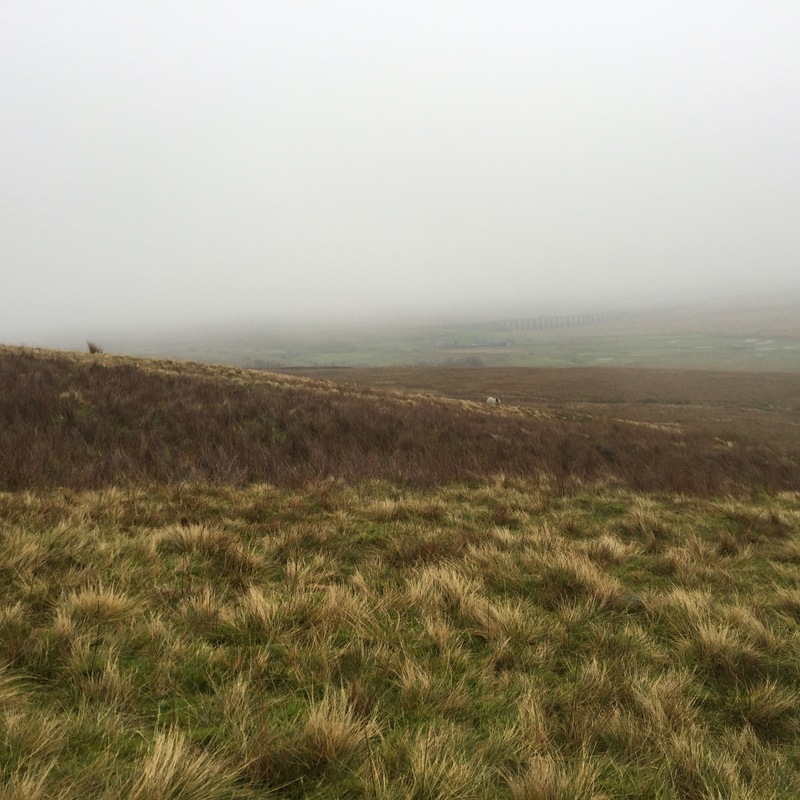 The wind was blowing the clouds and mist across the path and we could see about 30m each way. Our views were minimal but the power of nature and the area was amazing. We followed the path and started to see some snow. It was a good path but the incline was testing, we kept thinking we had reached the summit ridge as the wind built. 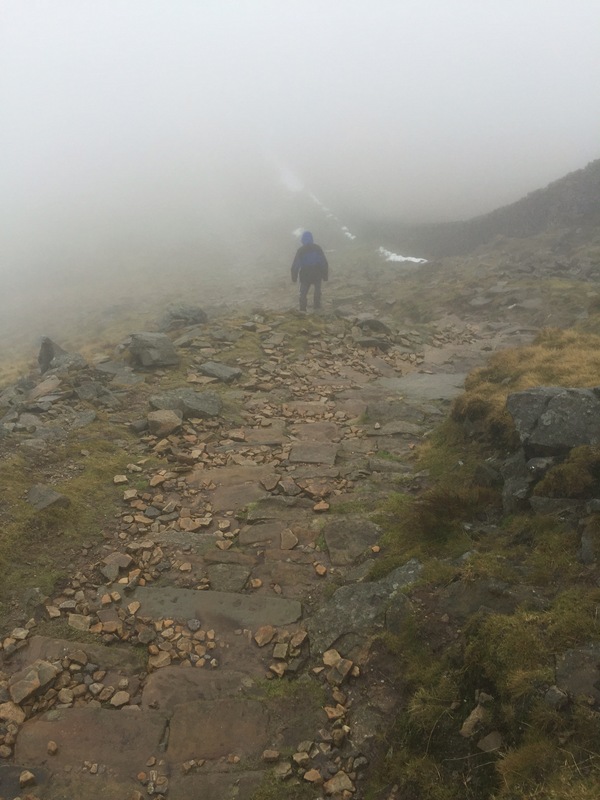 We certainly hadn’t and when we hit the new stone causeway the climb got steeper it was like a hard workout on the stair master, relentless steps in the clouds. With any step we might break through into the land of the giant from the beanstalk story. We met a few more hikers and walkers up here, one lady with a walking stick had got to a point that was inspiring, steady and consistently she kept moving towards the top. The path was narrower, the wind a lot stronger and the snow more prolific. An impression of height gave away the steep drop to the left though it was good fortune that the low cloud meant I could not see it. The feeling of nature was tangible up there, wind, height, granite, coarse grass and snow. Strength and awe in a surround sound experience. Exhilarating I loved it. The climb was hard and took our breath at parts not for the feint hearted. On the top we almost missed the summit marker which was over the other side of the wall on the Cumbrian side. It was fairly busy up there and a sharing of cameras happened to allow us all to get our pics that were the order of the day. We then started down the other side. Down sounds easy but today it was not. As we started the gradient didn’t seem too bad and we would be down in a minute. No, no and no it got steeper and the amazing stone causeway turned into a staircase and a rickety, wobbly one at that. 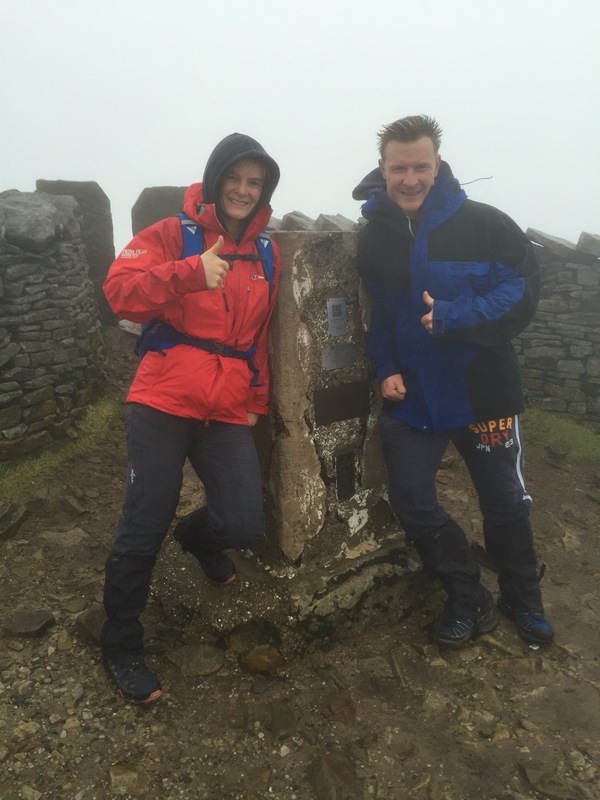 The knees took a bit of a battering but, we had done the summit, now the time to get back was the goal. As we got lower we were able to see more and more and it brought home how little we could see at the top. The clouds gave way to an expansive field of vision with the large viaduct off to our left. Once down into the valley it was a lovely walk across the rain sodden land back to our starting point. As the viaduct loomed closer and we neared the end my aches and pains returned. I am pretty sure if I were to tackle another peak immediately I would have felt more sprightly and fresh but the end in sight the adrenaline dropped. In the end we did the 8 miles in 3 hours 6 minutes with photos and two wrong turns so not bad for a first stab. We learned a lot in the process and are eager to get back to tackle another peak when we can. 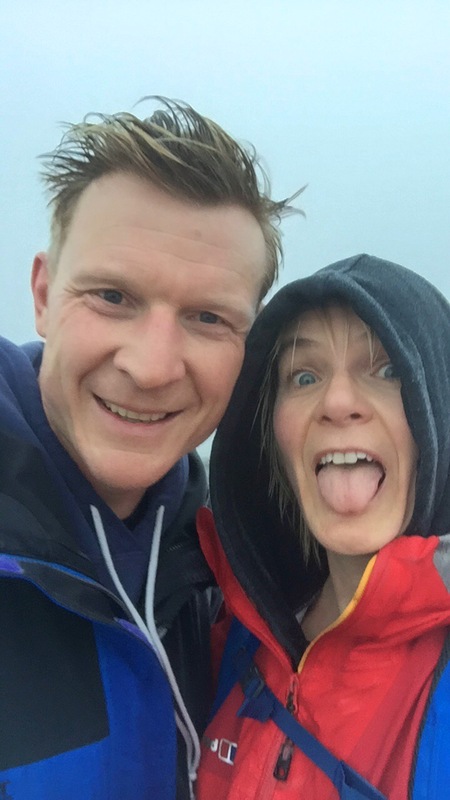 If any of you can get to tackle a peak before our three peak challenge I would advise it. If not that far then tackle a good 8 or more miler in the Peak District. No excuses lets prep for this thing it’s not called a challenge for nothing. 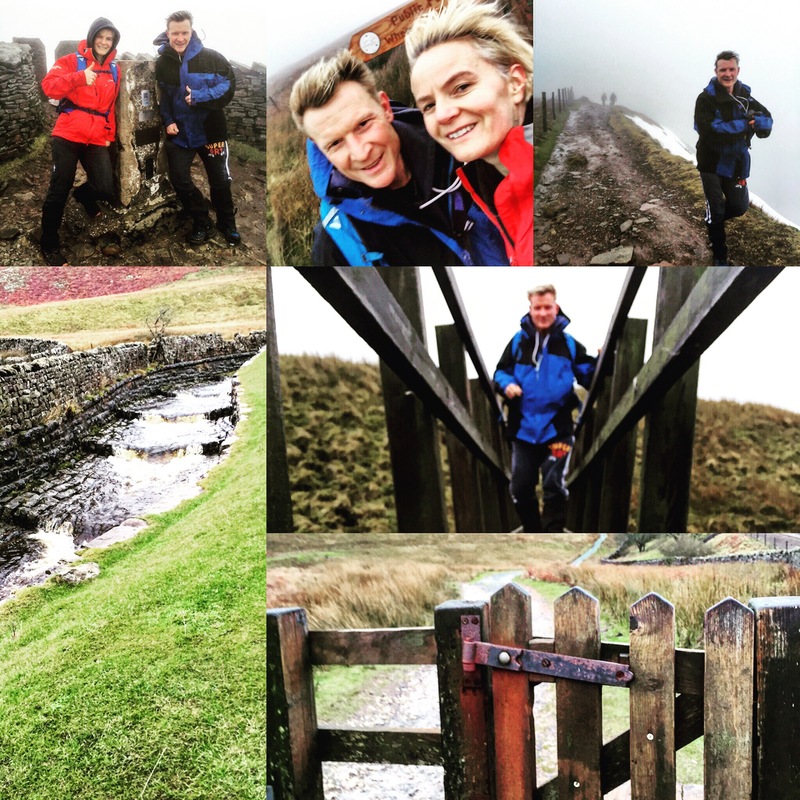 This entry was posted in Fitness, General, Team Evo and tagged eviolution gym, gym sheffield, s20 gym, three peak challenge, whernside on January 24, 2016 by billybicep. NLP Techniques – MirroringIt’s not quite what it sounds….. Ever wanted to be a little more supported, motivated or committed. This is the art of influencing behaviour (the ways we think and act) through the use of communication. By understanding how we think we can re-programme the brain to react differently to stimulus. To take this to a higher level we would advise undertaking an NLP course however there are some basic tips and methods that’s are accessible to all of us,in fact we all use NLP already innately to varying extents. Mirroring is the simple process of mimicking behaviours to build rapport. We all do this naturally to some extent but we can get better at it. It is extremely hard to dislike someone who is mirroring you, however this is only true if it is subtle and appears to be natural. Otherwise it’s a little disconcerting that the person you are with is copying your every move and word…. Like an annoying little brother. This is the difference between a good conversation and a punch. I know someone who adopts the accent of whatever country they travel to, this is a little extreme but is an unconscious act and probably an innate desire to mirror. Mirroring is conducive to good communication and building rapport. Give it a go and watch out for it happening naturally between groups of people. Mirroring an accent is a little too obvious and often has the opposite effect. The more different something/someone is from ourselves, the more we fear it/them. This is why mirroring is so effective, it is the art of making yourself more similar to your chosen person. This builds trust at a subconscious level. This entry was posted in General and tagged NLP, Team Evo, Tips on January 10, 2016 by billybicep. 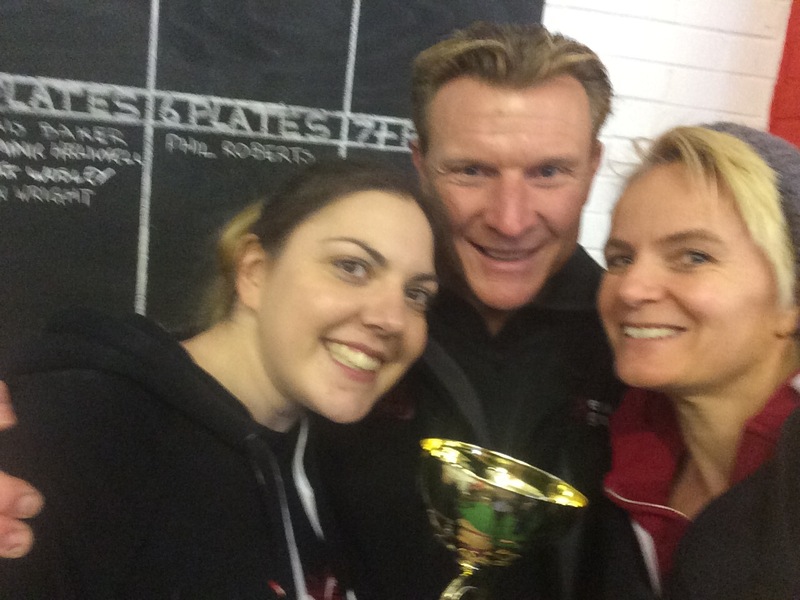 2015 was a brilliant year for Evolution Gym, it’s friends, members and staff. Outside gym life people gave birth, got married, got new jobs, new cars, new houses it was not all roses but lots of good stuff happened. Inside the gym there were new members, new friendships, personal bests, new goals and great achievements. 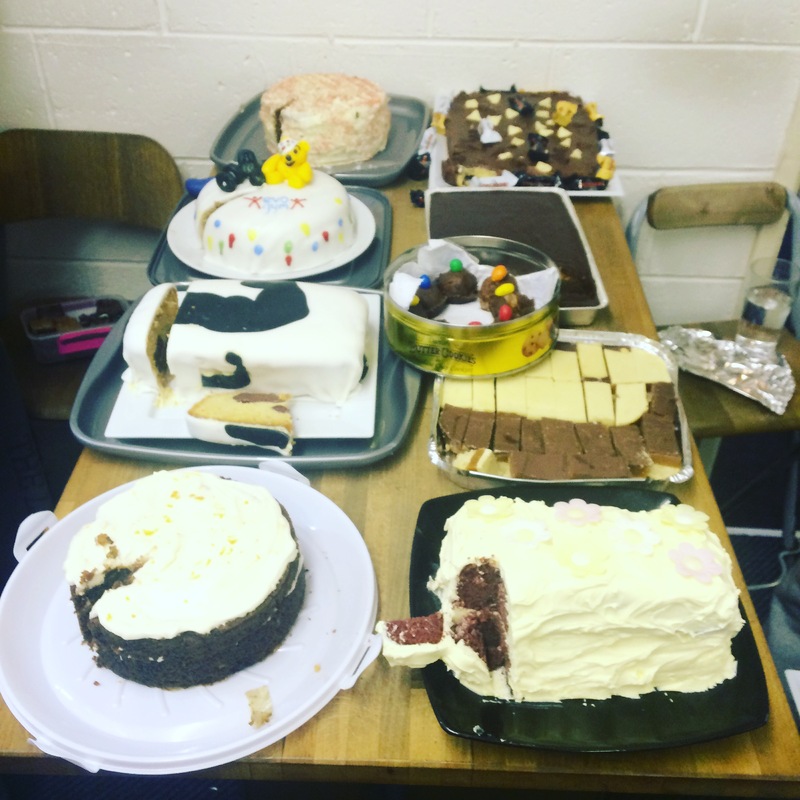 As a group we did a bikeathon for comic relief and raised loads then in November we had the first ever Great Evolution Bake-thon won by Alex, although all bakers and eaters were winners as we raised 200 quid for Children in Need. 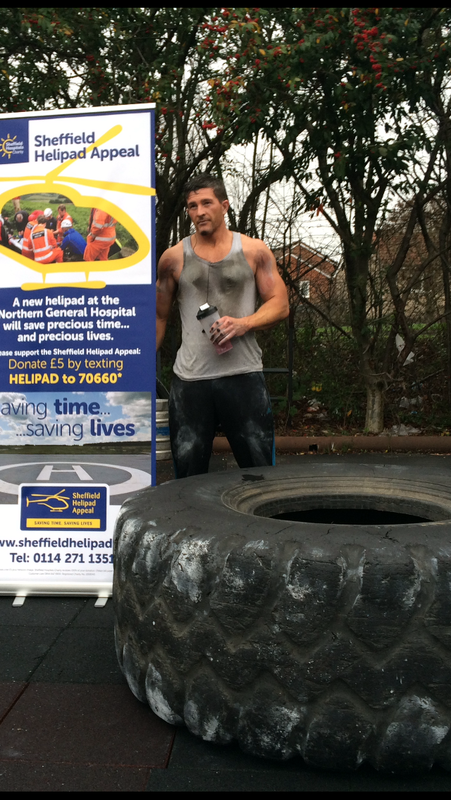 Probably our most amazing charity event was the Sponsored Tyre Flip for the Helipad at the Sheffield hospitals. 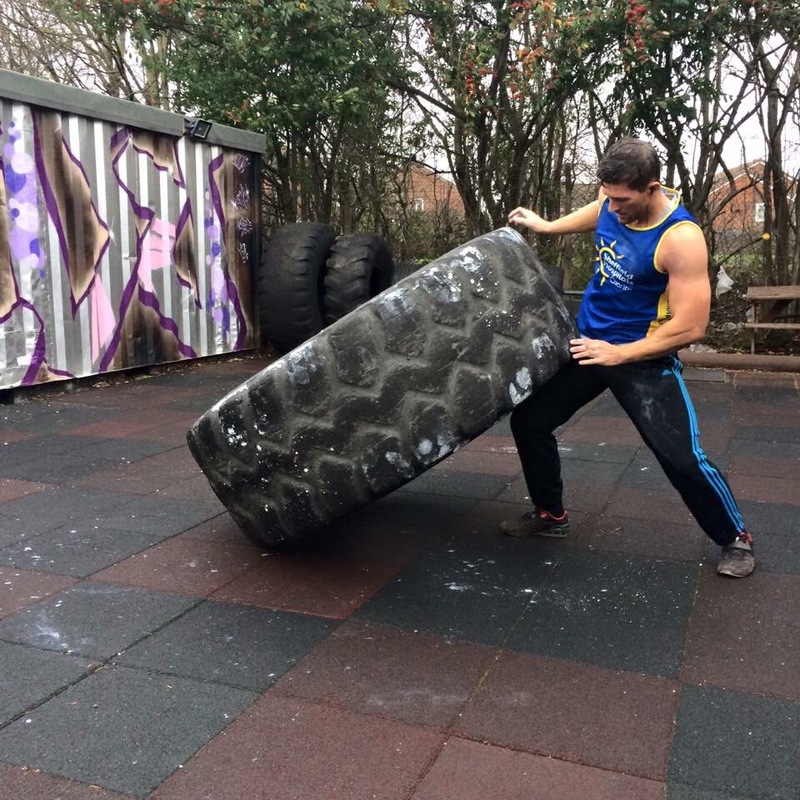 Adam Saltfleet, Evolutions resident strongman showed us all what he is made of and its stern stuff. Over the space of 3 hours he flipped a 320kg tyre over 300 times. In total he flipped 98,880kg. Now if someone tipped 98 tonnes of gravel at the end of my drive and told me to move the pile 10ft I would decline politely for fear of death but that is what Adam did. The support was brilliant but only Adam could do it and with grit and determination he ran up a massive score. An amazing feat for Adam more amazing was the amount he raised, over £1000 on its way to the helipad. We are really proud to call Adam one of our members, well done dude. 2016 aims to be just as special with a sponsored Yorkshire Three Peaks Walk in April (Alzeheimers) and a Total Warrior team in June. A bake off again for Children in Need and maybe more. If you are doing something special for charity let us know. 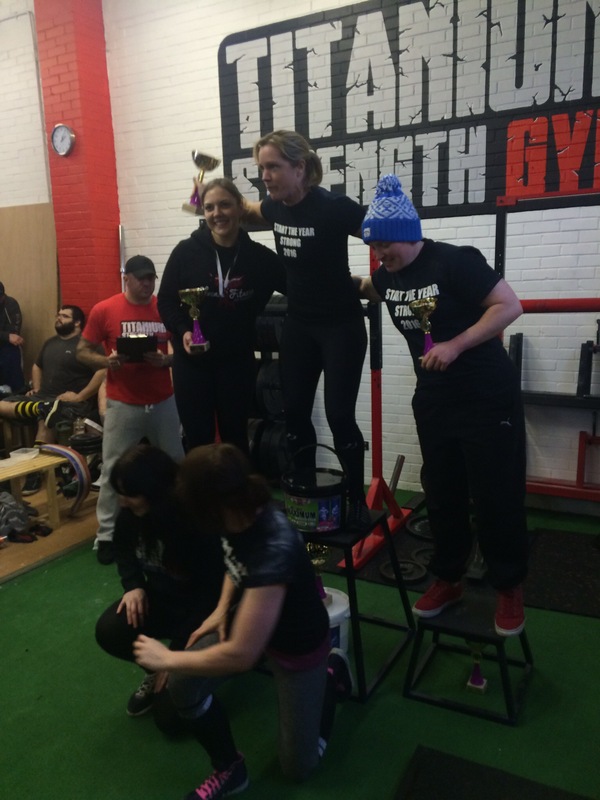 This entry was posted in General, Team Evo and tagged charity, evolution sheffield, fundraising, Team Evo, winners on January 10, 2016 by billybicep.